In the opinion of some specialists, this female figure -kneeling in the orant, or praying, position- was originally holding a book and represented Prajnaparamita, mother of all Buddhas; others believe instead that she was making a gesture of prayer, and in fact represented Tara, paredra of the bodhisattva Avalokitesvara. Both identifications are compatible with the presence of the jina who appears in front of the headdress. Furthermore, the facial features are often considered to be those of Jayarajadevi, one of the wives of Jayavarman VII (r. 1181-1218?). The meditative expression with closed eyes is an integral element of the Buddhist context within which the work was created, and displays the celebrated “Angkor smile” which appeared at this period. The delicate, sensitive modelling reveals the emergence of a profoundly humanistic naturalism previously uncommon in Khmer art and which signalled a break with the hieratic Brahmanic art of earlier periods. It is characteristic of the Bayon style that spanned the late 12th and early 13th centuries. As is often the case with Khmer statuary, the figure is unfinished and the base has been left in a rough-hewn state. The role of the highly refined Bayon style was to convey the essence of a sophisticated form of Buddhism in response to new religious preoccupations. Indeed, the sack of Angkor by the Chams in 1177 had led to a loss of confidence in the Brahmanic deities. 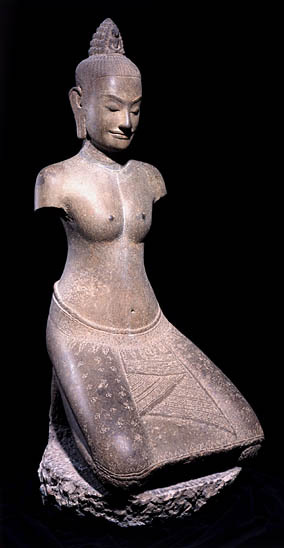 Under a new Buddhist monarch, Jayavarman VII, the Khmer empire was to reach its zenith. The king laid out Angkor Thom, the last capital at the Angkor site, and adopted ’Great Vehicle’ (mahayana) Buddhism as the state religion, building many religious monuments.